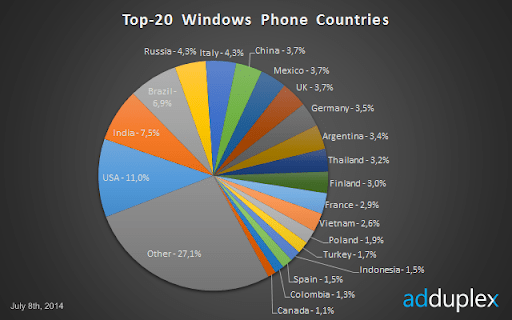 Back when we started publishing Windows Phone statistics reports we were posting an interesting chart showing relative numbers of Windows Phones in different countries. At some point we realized that since we have quite a few bigger (hero) local or regional apps, they skewed the numbers in favor of some countries. Quite often pretty dramatically. So we stopped including such charts in the reports. As a “workaround” this chart is based on data from 11 global apps and games that served AdDuplex ads on the day of July 8th, 2014 (UTC time). These apps served ads to around 200,000 users on that day. The apps were deliberately selected to be as “global” as possible, but the dataset could still be affected by different ad strategies of the app publishers on a country-by-country basis and other factors. We will try to improve on this concept for the future reports. AdDuplex Direct is Here – Advertise in Great Windows Phone Apps and Games! Currently statistics much better than on flash. Thanks.